ww2dbaseThe Philadelphia Navy Shipyard in Pennsylvania, United States dated back to 1776 as the country's first naval shipyard. It officially became a US Navy site in 1801. In 1871, new facilities began to be established for the building of modern ships. In 1917, the Naval Aircraft Factory was established at the shipyard's League Island site. After WW1, the world's largest crane, weighing 3,500 tons, was installed at the Philadelphia Navy Shipyard. In 1926, Mustin Field began operations at the Naval Aircraft Factory site. 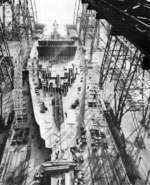 The WW2-era would represent the shipyard's most productive period. During this period, it employed about 40,000 workers, launched 53 ships, and repaired 574 ships. Among the ships the yard had launched were the large and modern battleships USS New Jersey and USS Wisconsin. It also participated in the American atomic weapons research as Philip Abelson developed the liquid thermal diffusion technique for separating uranium-235 at the Naval Laboratory at the shipyard. After WW2, the shipyard's workforce dropped to 12,000. In the 1960s, ship construction began to be contracted out to private firms. In 1963, Mustin Field ceased operations. The final ship built at the Philadelphia Navy Yard would be the command ship Blue Ridge, launched in 1970. In 1991, the Base Realignment and Closure Commission recommended the shipyard's closure, and in 1995 it was formally closed. The 1,000-acre-sized land where the navy shipyard resided were transferred to the city of Philadelphia in Mar 2000. Today the site is of mixed use, with commercial and industrial tenants (including a commercial shipyard), and a small US Navy presence. 30 Jun 1932 USS R-5 was decommissioned from service at Philadelphia Navy Yard, Philadelphia, Pennsylvania, United States. 4 Apr 1943 USS S-44 arrived at Philadelphia Navy Yard, Pennsylvania, United States. 14 Jun 1943 USS S-44 departed Philadelphia Navy Yard, Pennsylvania, United States. 19 Jul 1943 The US Naval Aircraft Factory in Philadelphia, Pennsylvania, United States was authorized to embark on the project codenamed Gorgon to develop air-to-air turbojet-powered remotely-controlled missiles. 24 Sep 1944 USS Wisconsin departed Philadelphia Navy Yard in Pennsylvania, United States. 12 Jul 1946 USS Portland was decommissioned from service at Philadelphia Navy Yard in Philadelphia, Pennsylvania, United States. 7 Nov 1949 USS Sea Cat arrived at the Philadelphia Navy Yard, Pennsylvania, United States for upgrades. 11 Mar 1950 USS Sea Cat completed her upgrade work at the Philadelphia Navy Yard, Pennsylvania, United States. 3 Jan 1951 Upon ccompletion of submarine Ray's conversion into a radar picket submarine at Philadelphia Navy Yard, Philadelphia, Pennsylvania, United States, she was resignated SSR-271. 15 Jan 1952 USS Sea Cat arrived at the Philadelphia Navy Yard, Pennsylvania, United States for conversion into a Fleet Snorkel submarine. 26 Jun 1952 USS Sea Cat completed her conversion work at the Philadelphia Navy Yard, Pennsylvania, United States and departed for Key West, Florida, United States. 27 Mar 1953 USS Ray departed Philadelphia Navy Yard, Philadelphia, Pennsylvania, United States for a training cruise off eastern United States and in the Caribbean Sea.